Participating in sports can benefit athletes in many ways, including the development of healthy exercise and eating habits; working together with others on a team; learning the benefits of hard work, focus and determination; and understanding how to gracefully win and lose. For Northern Arizona University graduate Ray Perryman, sports also helped crystallize his lifelong passion for helping people that led to a career in behavioral health services. Perryman played football at NAU from 1997-2000 while pursuing a degree in hotel and restaurant management. After playing professional football for several years, he now serves as the Community-Based Supervisor for Four Directions, a Chandler-based organization that mentors at-risk youth and families in life skills, while helping to provide stable and healthy home environments. Born in Arizona, Perryman spent much of his youth traveling back and forth between Phoenix and Arkansas, where much of his family lived. His childhood was challenging, with a single mom and little money for the basics of food and clothing. When he became a teenager, Perryman spent summers in Arkansas earning money so he could buy school clothes. It was tough for him at the time, but, as he has throughout his life, he learned life lessons from the experience. “As a kid, you don’t really understand the reasons for things, but later on you realize that hard work can benefit you, realizing you can earn your way rather than things being given to you,” he said. By high school, Perryman realized football could do even more for him. Starring at South Mountain High School, he looked to the future and identified football as a pathway for going to college. He believed if he worked hard enough, he could get a scholarship to pay for the tuition, lodging, books and other needs that he wouldn’t otherwise be able to afford. By that time, Perryman’s mother married and his new stepdad also counseled him, showing him “how to be a man, how to work toward personal goals and how to be relentless on the field,” he said. Perryman says he enjoyed the independence of college life, as well as the opportunity to live in a place with snow. He initially wanted to take classes that would lead to a career in the hospitality industry – particularly in food services – but eventually changed course. At the same time, Perryman found success on the gridiron. 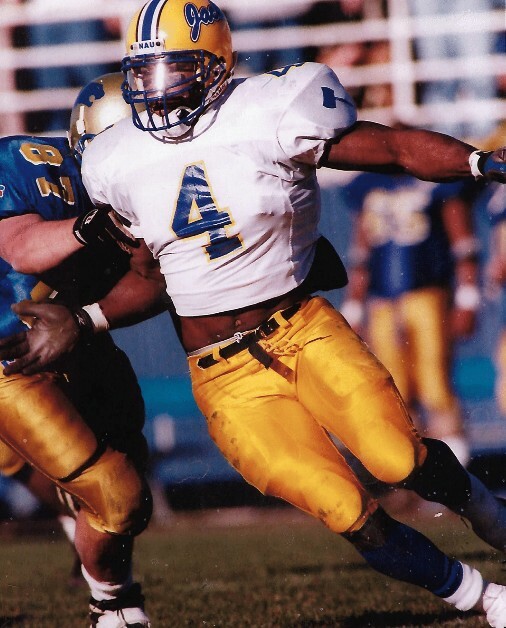 Under the tutelage of Head Coach Jerome Souers, he played on the football team all four years at NAU and ended his college sports career as one of the top defensive backs in school history. He was twice named to the All-Big Sky Conference First Team and twice recognized as an All-American. He fondly remembers not only the competition on the field, but the camaraderie with teammates off the field. “Coaches meetings,” for instance, involved the team getting together for potlucks and other informal gatherings. The team volunteered at local high schools and was involved in community service efforts. His NAU football success parlayed into a professional career. He was chosen in the fifth round of the 2001 NFL Draft by the Oakland Raiders. He would play five seasons in the NFL, as well as two in the NFL Europe League and one in the Canadian Football League. Perryman was inducted into the NAU Sports Hall of Fame last fall. Today, he works with Native American communities through Four Directions, helping children develop a foundation to find success in life.